That which is hateful to you, do not do to your neighbor. With Y, long haired and black bearded, skinny, serious, looking like a settler, driving his rented car with yellow plates, on December 12, 2007 we made our first pass thru Ma’ale Adumim, post Annapolis promises by the Israelis to freeze selected settlement construction. 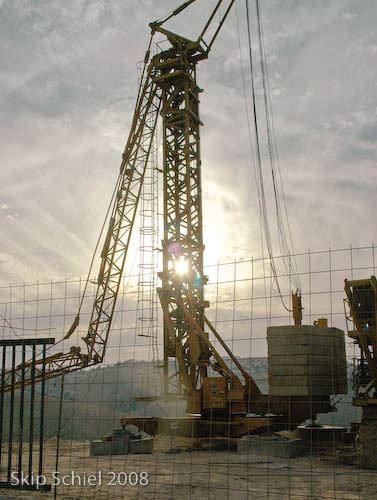 Orders have been given to halt construction activity in the settlements of Maale Adumim, east of Jerusalem, and the Ariel bloc in the northern West Bank, the radio said citing housing ministry officials. 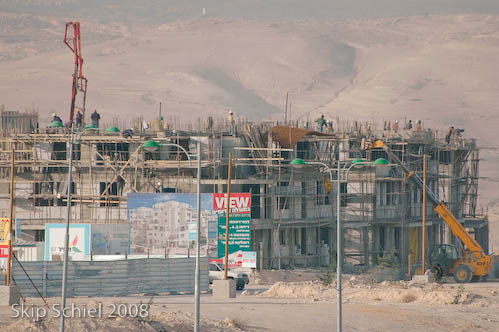 Two weeks later, on January 1, 2008, Y, his girl friend I presume (also speaking Slavic), two Swedes (a couple), and I toured Ma’ale Adumim for the second time for photos of new construction. This time, differing from the last time about 2 weeks ago, workers were swarming all over the buildings, a clear testament to ongoing construction. The idea is that Olmert promised at Annapolis to freeze new construction but his words then were ambiguous. Later he promised unequivocally that all new construction at Ma’ale Adumim and some other sites would cease. We have proof this is a lie. 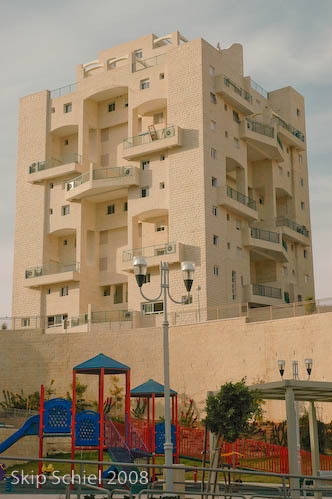 Ma’ale Adumim is gargantuan, and in its own way, leaving morality and justice side, gorgeous. Elegant even. Very efficient mass housing. Tall apartment complexes alternate with lower ones, a bit like the town houses and towers of such notorious housing experiments as Chicago’s ill-fated Cabrini Green. Buildings have multi entrance levels because of the sloping terrain. Sturdy appearing, windows often tightly shuttered, concrete block under limestone façade walls, and probably serious entrance security. I often find myself wondering how residents in places like this interpret their quality of life. They are squeezed tighter, in what appears to be a homogenous living arrangement. Similar buildings, similar people. But maybe not. Life appears calm and secure here. Altho we radicals had no trouble entering: Y’s yellow plated car our entry pass. Not stopped, not interrogated, we had a plan for this, not shadowed as far as we know, we had free reign, a dream in motion. The workers were all Palestinian and some seemed happy to have us photograph them. We photographed some in prayer. The construction looks efficient, beginning with carving out flat sites from the soft limestone, pouring concrete into forms, then facing with limestone. Diggers were preparing sites with heave equipment. Men put finishing touches on some homes. Signs advertising the housing were everywhere, very appealing designs I might add. Many of these homes are on hillsides and thus offer tremendous views: of Palestinian villages. The hour was late, the workers had quit for the day, the light was fading. We tried again at Pisgat Ze’ev, roaming thru the settlement near the Palestinian town of Beit Hanina where I resided for a few days with a family a few years ago. Buildings packed close to one another, little open space, limestone and concrete everywhere, living on confiscated Palestinian land—how is life in such a place? I’d love to interview residents, of all stripes. Too bad my lens slipped back into its stuck mode. It had worked well for the past month, despite the loose screw and apparent glass damage. And then, just after photographing at Pisgat Ze’ev, the sweep of homes, the nearest with a swimming pool, it stuck again. It now only ranges from about 20-30 mm. What to do? And while on my way to Gaza. Last night I edited and processed the photos, delighting in how vividly descriptive, maybe even emotional, some are. Returning to the earlier set which included the light rail system construction, I put them into web form and intend to upload them today. I’ll add yesterday’s settlement photos and upload them as well (if I can reach my server). J, ever vigilant, and seemingly over his disappointment in not getting his visa renewed and losing a girlfriend, coordinated all this activity. Another team went to other sites. We both videoed and photographed. He implored me to download the photos off my camera and put them on his hard drive. Others in the room watched over his shoulder as he surveyed my photos. I heard many oohs and ahhs, good work Skip! This is reward enough. J planned to bring the photos and videos to Al Jezeera last evening and try to arrange for their use: a stunning rebuttal to Olmert’s promises. J was serious about this, did significant planning and worrying, he wanted it to happen. He had a team at Har Homa and needed more coverage. Good work, Skip. The settlement expansion is in full swing and is now fully documented. 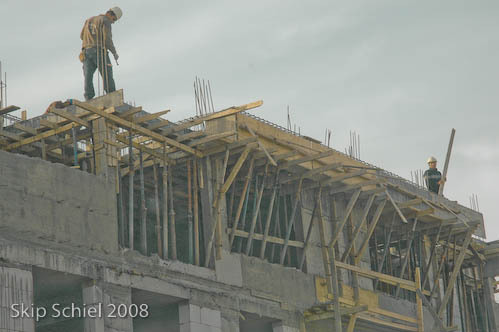 Excellent photos of the workers and ongoing construction. Why does this lie continue – it’s not even hidden. I am continually mystified…..